I love watching Josh work out. Partly because he enjoys it and seeing his face light up with pure joy makes me happy. But I also get a glimpse at miracles being born. Not everybody gets to see that. 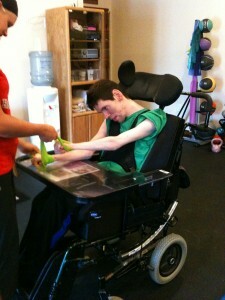 Josh is entering his fifth month of working with a personal trainer. Five months. That is such a short amount of time when you consider that he’s 32 years old. And in 5 months I’m seeing changes that give my spirit wings. I can’t even imagine what it feels like for him. Josh continues with his range of motion stretching at the beginning of each session. We’re seeing a lot of improvement in the decrease of reflexes and an increase in relaxation. 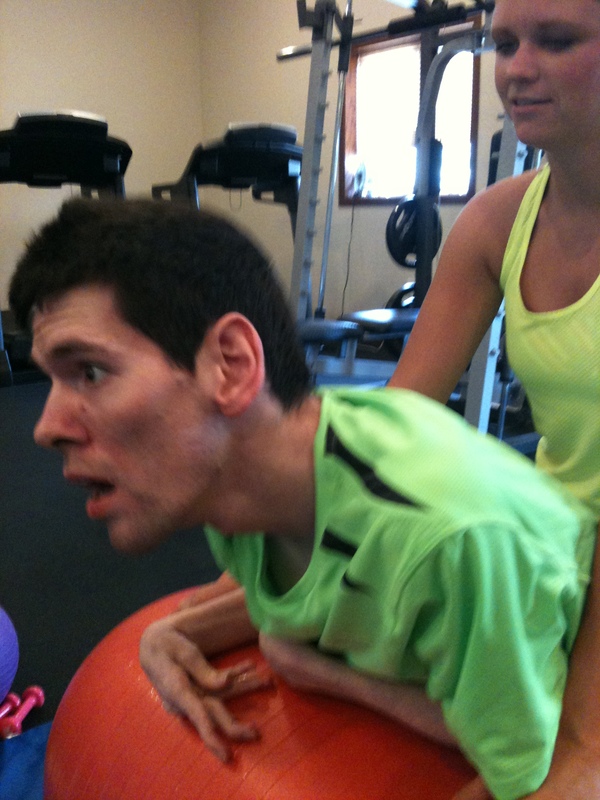 Abbey, and Dr. Velos, are beginning to be able to move Josh’s arms and legs in ways that were impossible five months ago. But for me, the real miracle lies in watching how Josh’s brain works. Now that Josh is working out twice a week instead of once, Abbey has divided Josh’s exercises. On Mondays she gives him exercises that make him think. She will tell him what she wants him to do; she’ll touch and explain which muscles she wants Josh to use; she’ll explain to Josh how his body should work; and then we sit back and watch him work it out. I really do need to set up a video camera on these days to take you on the journey with us. It is so interesting to watch Josh. He is especially enjoying the work bench and the wrist and ankle weights. When he lies on his back his right arm goes into a beautiful extension and lies off to the side. His left arm goes into a tight contracture, held close to his shoulder and chest. Not the best position to do fly’s. I can’t seem to find my pictures of the weight bench work out. I’m sorry. It is incredible to watch. But since this part of the article affects the part coming up I’m going to continue with the description. Josh can’t just lift his right arm. The first thing he does is visually hunt for his hand. He turns his head and has to see where his hand is. Once he sees it, he can move the arm. He does each arm independently of the other until both hands get within his range of vision. 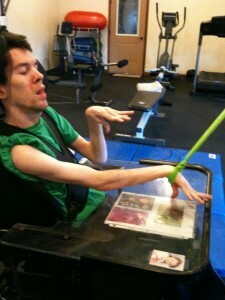 We have discovered that when he has the wrist weights on, he seems better able to find his hand. The weight on the wrist helps his brain identify where it is without him having to visually see the hand. 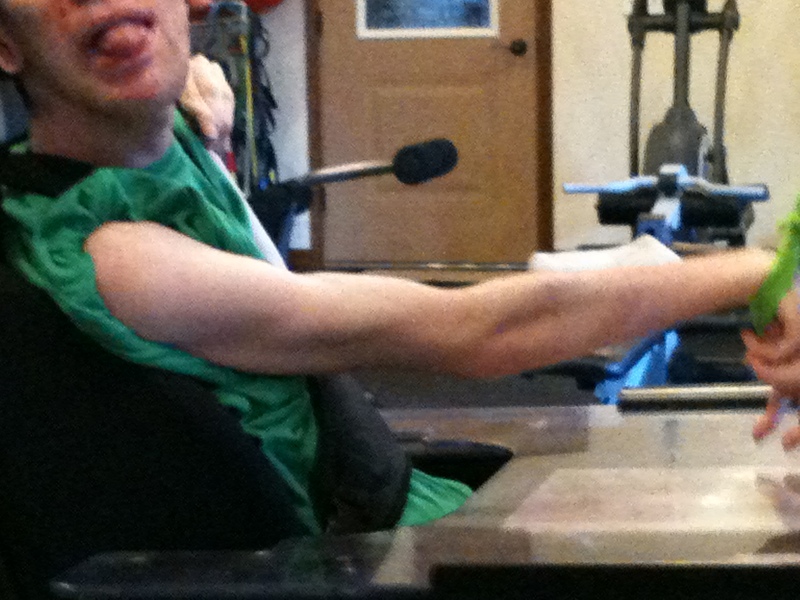 From the weight bench, Josh goes to his chair. 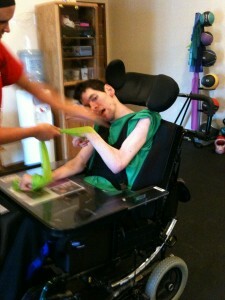 On Monday’s, Abbey has started to use resistance bands with Josh. Since Josh’s right arm has beautiful extension, she starts with the right arm. Josh’s grip is never reliable so she ties the band around his hand so if it pops open he doesn’t drop it. When you look at this pictures you can clearly see how straight Josh can get the right arm and how contracted his left arm is. This is Josh’s normal positions. Then Abbey did something interesting. She tied the other end of the band to Josh’s left arm. And I saw something happen that I consider miraculous. Here we see him with bands on both hands. Watching him, I could see him thinking and then I saw something happen. He started to extend his left arm. Very seldom do I see him extend both arms at the same time. If one goes out, the other tends to come in or up. But left arm starts to straighten. And here you see both arms extended but, even more important, I saw him putting pressure on the bands with both arms at the same time. I can’t remember ever seeing him use both hands at the same time. To me, this seems to indicate that both sides of the brain were firing. Left side and right side, working together, and hopefully, meeting in the middle. This is the beginning of something that could become very important in Josh’s life. As always, I don’t know where this journey will end. I’m only glad that I’m here to witness it. Highlights from the workout. I’m sharing these just because they make me happy. Josh’s face when he looked up and caught site of himself in the wall mirror. That look of wonder will never leave me. It took some work but Josh, with no help from Abbey or me, got his elbows in position and brought himself to a full kneel. I think this is only the 3rd time I’ve ever seen him do this. It’s a start and it’s own little mini-miracle. I have to share this. I’m used to seeing a bicep on Josh but when he had his arm flexed and I saw, on the side of his arm, the beginning of a tri-cep it made me smile. I think this may be the most beautiful arm I’ve ever seen. I’m so proud of Josh for doing this. Before I leave this week’s update I want to share a couple of ideas I had. I’m always trying to figure out ways to motivate Josh and figure out ways to help him accomplish exercise goals. I get easily bored, so I figure the time will come when Josh will too. So I put my thinking cap on and I have an idea that I will be implementing soon. 1. 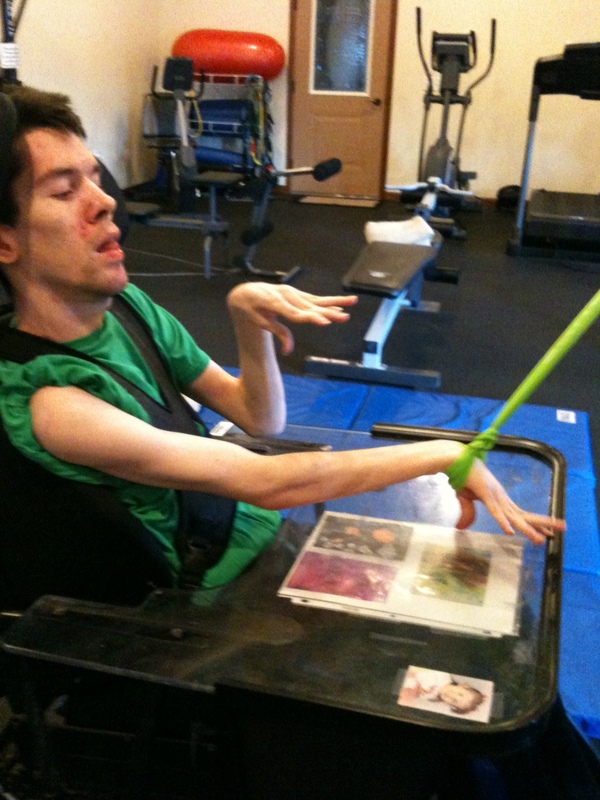 When I saw his response to the resistance bands on his hands; how it seemed to help his brain identify where his hands are without having to visually find them, it occurred to me that maybe if Josh wore something on his hands, the feel would assist in his brain moving the hands. I remembered seeing craft gloves. They are thin, lightweight, without fingers. I thought I would order a pair and put them on Josh’s hands before a workout and see if the feel of those gloves would help his brain know where his hands are in space. It’s worth a try. 2. I was at the hardware store and saw a portable clothes rack. It occurred to me that I could position the rack so it was over his tray and then we could hang objects from it that would encourage Josh to reach out and interact with whatever hung from the rack. Because of Josh’s age, and the fact that he’s got normal intelligence, I tried to figure out what he would like. I think I can hang the punching bag from it. Josh seems to like the idea of learning to hit a bag. I don’t know if any of this will make a difference but they are on my list to try. I’ll keep you updated on how it works. That’s it for this week. I feel like I’ve been blessed. I wanted to share that with you all. 4 Responses to Witnessing the Birth of Miracles. I had to share that photo, Nita. The look on his face is priceless. The changes that have happened in just five months is so inspiring. Loved this workout, Josh. Wow, what muscles you are getting. Enjoy your workouts. Things do get tiring when you have to keep repeating, repeating, But, the outcome is very worth it. Marilyn, than you for stopping by. Josh is so excited by his workouts and he loves to share. I am so amazed by his progress.